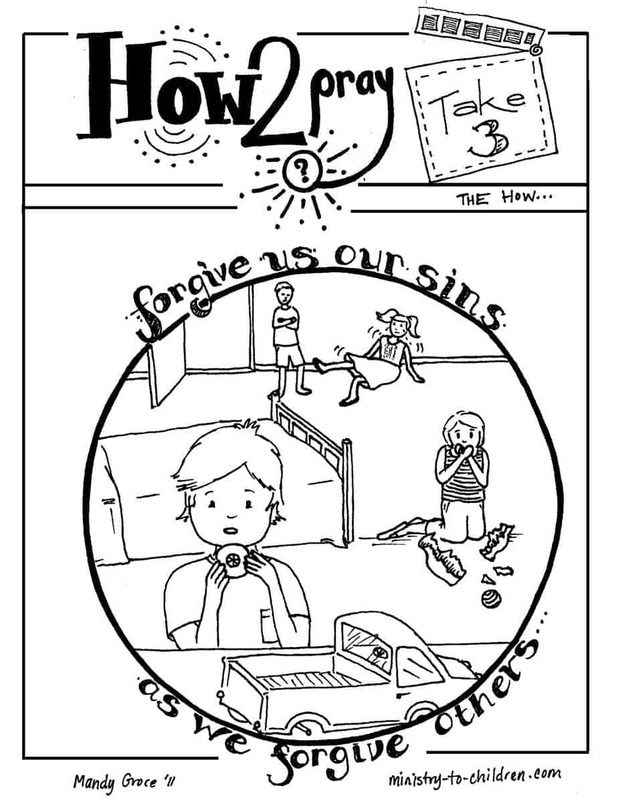 This is the third sheet in our free Lord’s Prayer coloring book. Each page will illustrate and help children understand the concepts Jesus taught in this model prayer. Directions: Right-click on the links below to choose your file format. The PDF is for easy printing and the JPEG will allow advanced users to edit the image for their own purpose. Here is how Mandy explains the meaning of her illustrations. If you enjoy this “Forgive Our Sins” coloring page, please leave a comment to encourage her below. This sheet is intended to show how we all make mistakes, we all sin, and are all in need of forgiveness. This was a tough concept to draw, but I hope it comes through clearly enough. “the how” subtitle is in reference to the way that God shows us how to seek forgiveness with himself and one another through Christ. This is just one of our many free coloring pages. For more like this, browse the other prayer coloring pages we’ve uploaded. All our materials are 100% free to copy and use with your ministry, school, or family. Awesome drawing, Mandy. You were able to capture the different situations a kid oftentimes experiences. Lovely lettering, too. Keep using your talents to glorify God! Tony Kummer (Editor) reviewed & updated this page on : September 6, 2011 at 8:22 am. All our content is peer reviewed by our readers, simply leave a comment on any post suggest an update.